French, German, Spanish, and UK military and defense officials have been negotiating with Airbus Defense & Space as they look for delivery of tactical versions of the A400M military transport/cargo plane. There has recently been some angst over the inability of Airbus to deliver the AQ400M in anything other than the basic version of the plane. French, German, Spanish, and UK militaries are asking for upgrades in the aircraft that include a protected cabin and a self-defense system to protect aircraft and crew when flying in hostile areas. 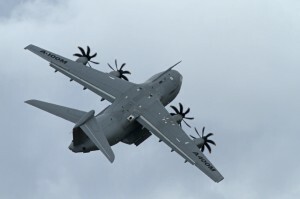 According to Airbus Defense and Space, the first tactical version of the A400M was recently delivered to the German Air Force and became the sixth A400M to enter service there. Airbus has delivered the first of 27 Spanish manufactured A400M airlifters as well. Contracts between these countries and Airbus include penalties for late deliveries, and Airbus will be paying late delivery fees. The delays were due to the challenge of retrofitting old planes and finishing up the design of new versions and completing certification testing, according to the German Defense Ministry. For Europe in general, the A400M is an important addition as it has twice the payload and range of the C-160 NC-130 legacy transport planes. The A400M is also able to take off and land on shorter runways thus making the aircraft more versatile (see video). The sale of Airbus A400Ms also comes with long-term Global Support Service contracts. The following video shows the Airbus A400M taking off. Amazing!